Ecotourism is a very important tool for the development of local communities and it promotes sustainable development. It can also be a very useful tool for research and environment education. ECOBAC wants to promote the development of ecological tourism, through consultant services in the following areas: training of tourism specialized guides, regulations, routes design and certification of services and installations. ECOBAC searches to benefit the companies that participate with concrete actions in the conservation of natural resources and that promote the economic and social development of local communities. We collaborate widely with Ecotours de Mexico, a pioneer ecotourism tour operator, which offers a different option for those persons interested in enjoying a unique adventure, and besides having fun they can learn about the places they visit, support and participate in our research and conservation projects. The “Program of Prevention, Information, Vigilance and Monitoring of Humpback Whales in Banderas Bay”, primarily involves weekly vigilance trips during the official whale watching season (dates legally set our by the Mexican government as the period that whale watching trips are allowed to be promoted and sold) with the purpose of providing information and checking that the tourist and private vessels do not break the whale watching guidelines that are laid out in official regulations of the activity by the Mexican government (see NOM-131-SEMARNAT-2010). The guidelines establish the conduct that should be adopted by vessels engaged in whale watch activities. The object of this program is to ensure good navigation practices of whale watch vessels, to prevent the harassment of whales, and to support the protection and conservation of this migratory species when wintering in the Banderas Bay. In the whale season of 2015 – 2016, this project celebrated its fifth year of consecutive work. A higher frequency of vigilance trips were made during the holiday periods, special holiday long-weekends and on the weekend days of Saturday and Sunday, with the aim to have greater vigilance during periods when the whales were more likely to be harassed by a higher number of tourist vessels. 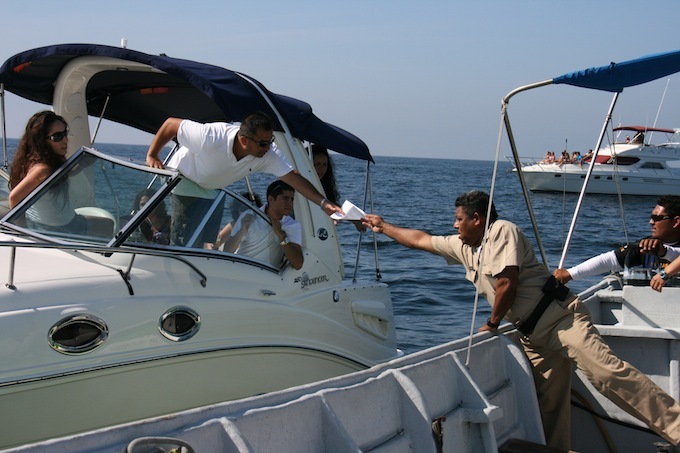 The calendar of planned vigilance trips is sent to the local Navy regiment (in Puerto Vallarta) and PROFEPA (Nayarit-Jalisco departments), as well as volunteers, to coordinate the outings with them all. In the last 3 years’ volunteers that participate, will also be part of the committee of vigilance of participative action for whales by PROFEPA, and therefore have proper official credentials. In the analysis of the results of the last five years that this project has been running, it was found that in general the number of vessels harassing the whales has decreased, that most authorized whale watching vessels maintain their distance and that the majority of vessels respect the time limit that a vessel is permitted to stay with the whales (30 minutes). Additionally, the number of vessels that obtain whale-watching permits annually has increased, and the number of private boats engaged in whale watch activities has decreased or remained the same. However, vessel crowding unfortunately is still occurring (in this context we define “vessel crowding” as four – 15 vessels surrounding a whale/group of whales), especially around mother and calf groups or active “mating groups”, and it is primarily the private unlicensed boats that are causing this problem. Unfortunately, is not uncommon to witness “vessel crowing” in the region and it is exacerbated by boat captains that look for groups of vessels to locate whales, rather than actively searching for the more subtle signs of a humpback whale (blow, splash etc.). In the first year of this program we found that around 44% of whale sightings (encounters of a whale/group of whales) were not accompanied by vessels engaged in whale watch activities (i.e. half of the seasonally visiting whales received all of the tourist pressure). However, in recent years this percent was reduced considerably, with only 29% of whale sightings not involving tourist vessels, suggesting less harassment. However, mother and calves continue to be the group that receives the most tourist pressure, maybe because the calves are often very acrobatic; 85% of the whale sightings involving mother and calf groups were accompanied by tourist vessels and often in large numbers (“vessel crowding”). Once again this was most commonly witnessed to involve boats without whale watch licenses. In general, the private fleet (boats without permission) represents 50% of the boats that engage in whale watch activities, which means that it is still a severe problem. The biggest concern is that captains and crew of the private unlicensed vessels do not have the proper information or the training to approach and observe whales in the correct manner, and that this could potentially lead to an accident with fatal consequences for the whales and/or people aboard the vessel. Included in the unlicensed boats, are boats that take tourist to watch whales illegally (pirates) and many of these are repeat offenders, and observed each season breaking the whale watch regulations in this way. 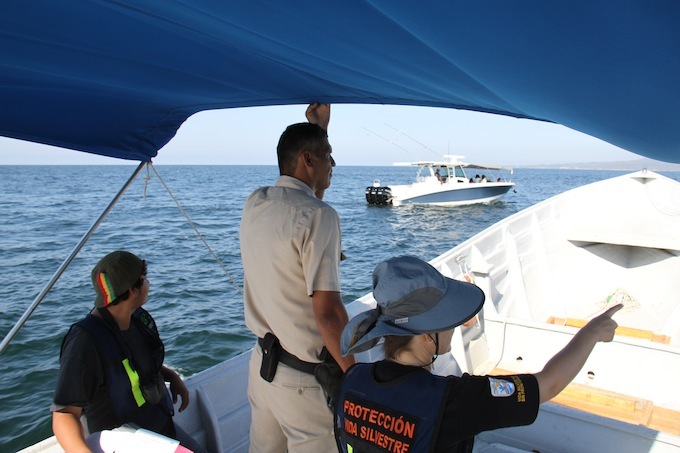 For this reason it is essential that PROFEPA (Mexican Wildlife Rangers) continues with vigilance activities, especially targeting illegal whale watching activities by un licensed boats. Another common problem is whale watching by jet skis, which is not permitted by the whale watching regulations (NOM-131-SEMARNAT-2010), because they produces a lot of (possibly harmful) noise to the whales, have very erratic and unpredictable movements, and also puts the tourists at risk, which on the majority of occasions are accompanied by children. The above points highlight the importance and the function of the program, and the need to continue our collaboration with SEMARNAT and PROFEPA, as well as including volunteers from the local community as part of the team. During the meeting for delivery of permits for the season 2015-2016, surveys were conducted to tour operators to assess whether the program was well known after 5 years of operation and if it has served to improve the navigation practices during the whale season in the region. The results were favorable, 93% of those captains surveyed have said to have changed the way they conduct whale watching, and that they themselves have seen a notable improvement in whale watching conduct by other tour operators. However, problems continue, as there is often a high turnover of captains. It is therefore necessary to continue to provide information every season and so with time, it will hopefully result in the generation of good whale watching conduct and habits, and to aid in the care of the whales of Banderas Bay (Jalisco-Nayarit). In conclusion, the program has seen excellent results, with the harassment and crowding of whales in Banderas Bay reduced considerably. These favorable changes have been the result of the constant effort to inform tour operators, tourist and private boat captains and crew about the good practice of navigation and the guidelines stated on NOM-131-SEMARNAT-2010, as well as the support and the presence provided by the Navy and PROFEPA during monitoring trips.